This article is about Mickey's Toontown in Walt Disney Parks and Resorts. For other uses, see Toontown (disambiguation). Mickey's Toontown is a "themed land" at Disneyland and Tokyo Disneyland, two theme parks operated by The Walt Disney Company. At Tokyo Disneyland, this land is named Toontown. A similar land existed at the Magic Kingdom until 2011 and was named Mickey's Toontown Fair. The attraction is a small-scale recreation of the Mickey Mouse universe where visitors can meet the characters and visit their homes which are constructed in a cartoonish style. It was inspired by "Toontown" from the 1988 film Who Framed Roger Rabbit in which cartoon characters live apart from humans. Roger Rabbit was recognized as a lucrative character by Disney after the release of Who Framed Roger Rabbit, and a set of attractions based on the movie was developed for Disney theme parks. Roger Rabbit was set to be the star of his own land, behind Main Street, U.S.A. at Disneyland, called Hollywoodland. Meanwhile, at the Magic Kingdom, a new land behind Fantasyland was being developed in honor of Mickey Mouse's sixtieth birthday, aptly named Mickey's Birthdayland. There were also set to be attractions based on Roger Rabbit, Judge Doom, and Baby Herman opening in a major expansion at the Disney's Hollywood Studios and Tokyo Disneyland, but after the financial troubles of the Euro Disney Resort, plans were cut back. Hollywoodland was combined with the concept of Mickey's Birthdayland, as well as a concept found in Who Framed Roger Rabbit, to form Mickey's Toontown, which opened in 1993 behind Fantasyland at Disneyland. 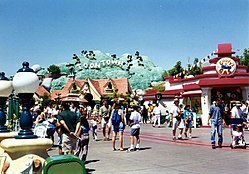 The attractions at Disney-MGM Studios were canceled, but an exact replica of Mickey's Toontown opened at Tokyo Disneyland in 1996. Disneyland Paris features a similar 'Toon Studio' in its Walt Disney Studios Park. Walt Disney World, Hong Kong Disneyland, and Shangai Disneyland are the only Disney resorts to have neither a Toontown or Toon Studio. At the Magic Kingdom, Mickey's Toontown Fair (now Storybook Circus) initially opened as Mickey's Birthdayland on June 18, 1988. It became Mickey's Starland on May 26, 1990, and was briefly renamed Mickey's Toyland in late 1995. The land was closed in early 1996 for an extensive refurbishment, and on October 1, 1996, it reopened as Mickey's Toontown Fair for the park's 25th anniversary. 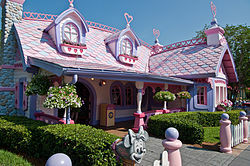 Its storyline portrayed the land as the holiday home for the characters who reside at Mickey's Toontown in California. Mickey's Toontown Fair was closed on February 11, 2011 in order to build the "New Fantasyland" expansion. Some elements of Mickey's Toontown Fair have been demolished and others have been re-themed to a new Storybook Circus area. The Dumbo the Flying Elephant ride was removed from Fantasyland and rebuilt in Storybook Circus, the new version doubling the capacity of the old ride and incorporating an interactive queue. The Barnstormer at Goofy's Wiseacre Farm has been re-themed to The Barnstormer featuring Goofy as the Great Goofini. The first half of Storybook Circus opened on March 12, 2012, which included the newly themed "The Great Goofini", the Storybook Circus train station which was completely rebuilt and also one half of the new Dumbo ride. The second phase of Storybook Circus, including the second half of Dumbo, the indoor queue area, and the Casey Jr Splash 'n' Soak Station opened in July 2012. Mickey's Toontown opened in Disneyland on January 24, 1993. The area is inspired by Who Framed Roger Rabbit, and resembles a set from a Max Fleischer cartoon. The buildings are stylized and colorful. There are several attractions involving classic cartoon characters, such as the houses of Mickey and Minnie Mouse, and a small children's coaster. There are a few interactive gags. Compared to other Disneyland areas however, there are few large or technically complex rides or shows, and the houses themselves appeal primarily as play areas for small children. On one of the windows above the library in this land, there is a reference to Laugh-O-Gram Studios, the studio that Disney created before the Disney Studios. An early entry event called Toontown Morning Madness was held here for guests booking travel with the American Automobile Association (AAA) or book a vacation package with the Walt Disney Travel Company. However, Morning Madness has been discontinued as of 2013 as Extra Magic Hour and Magic Morning are now offered. On nights that fireworks are scheduled, the land will close early for the day due to its proximity to the launch area for the fireworks. Mickeys Toontown Depot stays open from park opening to park closing as it also serves as a stop for Fantasyland with the station being next to the Fantasyland Theatre. On non-fireworks days, the land closes with the park. Toontown (Japanese language: トゥーンタウン) opened in Tokyo Disneyland on April 15, 1996. It is largely a copy of Mickey's Toontown at Disneyland, with a mirror image of its layout. In Mid May 2017, the entrance of Toontown has started to be removed, and will be replaced by a meet and greet attraction. Mickey's Toontown inspired an online role-playing game called Toontown Online, which was released in 2003. The online game is similar to Mickey's Toontown. On September 19, 2013, the online game was shut down. In the Wii game Epic Mickey, OsTown was inspired by Mickey's Toontown. However, OsTown features more "dog-faces", an Oswald the Lucky Rabbit fountain, and Clarabelle Cow. In July 2011, for the television program Curb Appeal: The Block, designer and host John Gidding installed a comical Toontown-style railing, made of styrofoam, on the front porch of an Alameda, California home. Despite the frequent chuckles provided to friends and neighbors, it was quietly removed and replaced with a more appropriate railing. 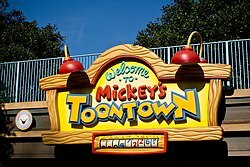 Wikimedia Commons has media related to Disney's Toontown. ^ Mickey's Toontown Fair Train Station at Yesterland. Yesterland.com. Retrieved on September 6, 2013. ^ Mickey's Toontown - Disneyland Park California. Wdwinfo.com. Retrieved on September 6, 2013. ^ Hidden Walts - Search for hidden references to Walt Disney - Disneyland Secrets and History (YouTube video). Fresh Baked. December 16, 2017. Retrieved December 16, 2017. ^ Early Admission Options | Disneyland Resort. Disneyland.disney.go.com. Retrieved on September 6, 2013. ^ "Chip 'n Dale Treehouse". Disneyland website. Walt Disney Company. Retrieved 2016-08-18. ^ "Mickey's House and Meet Mickey". Disneyland website. Walt Disney Company. Retrieved 2016-08-18. ^ a b "Gag Factory - Toontown Five & Dime". Disneyland website. Walt Disney Company. Retrieved 2016-08-18.